In the past I’ve created and published various Bootstrap navbar templates that you can find here, here and here. I use them in almost all my templates free and premium. 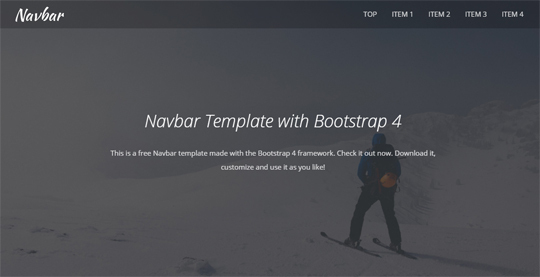 Today we’re going to create another navbar together, this time using Bootstrap version 4. 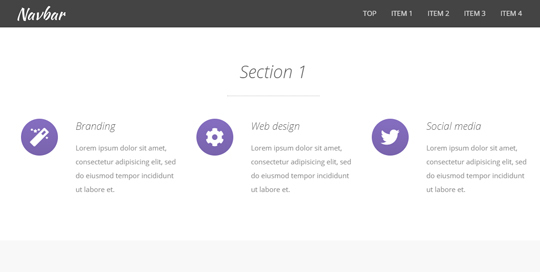 It will be a simple yet very functional top menu, an important part to have in the header of your websites. In this tutorial we’re going to create a simple Bootstrap 4 navbar / top menu with a logo and a few menu items that, when clicked, make the page scroll to the desired section. The top menu will have a transparent background that, when the page scrolls down, will change and become a solid color background. Below you can see a live preview and, at the end of the tutorial, you can download the navbar template with all its files. Before we begin I recommend you read a few articles about the version 4 of Bootstrap, if you haven’t already. They’ll help you become more familiar with this new version and see what has changed. Bootstrap 4: all the changes. Flexbox layout module: a complete guide. The rem CSS unit: an article to understand it. The new Bootstrap grid: the documentation page. In the “index.html” file we’ll have all the HTML code of our template including the code of the navbar. I’ve also added some other sections in this page to better illustrate the navbar functionalities. Here you can see the Bootstrap 4 libraries that we need to import. I’m showing only the code of the navbar here. You can see the code for the other sections of the template by downloading it below. As you can see above, we use a link with the class “navbar-brand” for the logo. We add the logo image in the CSS code (see below). Next we have a toggle button that is visible in mobile screens to hide/show the menu items. Last we have the menu items in a “div” tag with classes “collapse navbar-collapse”. Inside of it we use a “ul” list for the items, with classes “navbar-nav ml-auto”. The class “ml-auto” is used to push the menu items to the right. We style the navbar background and links, and we add a logo image. For the background we use an additional class called “navbar-no-bg” to make the menu transparent when the user is at the top of the page. What If I Don’t Like The Logo…? But how do we know when to add or remove this class? We need to know in which point of the page the user is as he scrolls up and down. This way, when the point of the page that we have decided is crossed, we trigger our function to add / remove the “navbar-no-bg” class. We achieve this using the Waypoints jQuery library. Now we have to make the menu links work, so that when a user clicks on a link, the page must scroll to the desired section. In the HTML code, that you can see above, we add the class “scroll-link” to each menu link and add the name of the desired section in the “href” property. The class “nav-link” is used from the Bootstrap library. We have the function “scroll_to” that handles the scroll animation to the desired location of the page. Then, each time a user clicks a link with the class “scroll-link”, this function gets called. 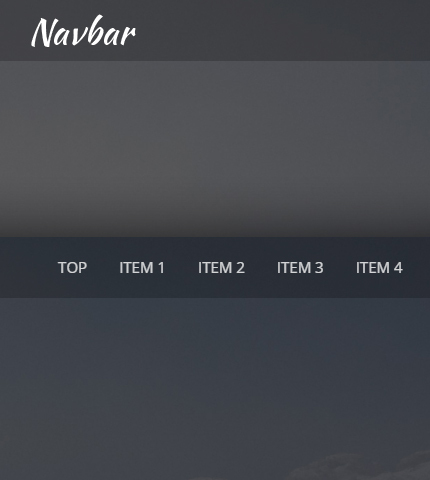 The Bootstrap navbar component is responsive by default, but here we have customized it so we have to make sure that it looks good in every device, from mobile phones to desktop computers. Now we can add some other elements to our navbar, like icons, search boxes, dropdown menus, etc. These are interesting topics for future tutorials.